Bryan Berg, the inventor of card stacking architecture on a grand scale, will recreate the Cloud City cityscape from the Star Wars saga using trading cards from the new Wizards of the Coast Star Wars Trading Card Game (TCG) - Revenge of the Sith. It is the tenth expansion for the Star Wars TCG. The galaxy's largest Star Wars-themed card structure ever to be created will be constructed this weekend during Celebration III, the Star Wars fan convention that kicks off April 21 at the Indiana Convention Center in Indianapolis. Bryan Berg, the inventor of card stacking architecture on a grand scale, will recreate the Cloud City cityscape from the Star Wars saga using trading cards from the new Wizards of the Coast Star Wars Trading Card Game -- Revenge of the Sith. The completed skyline will contain approximately 75,000 trading cards and stand more than 9 feet tall and 12 feet wide. Berg will spend more than 40 hours assembling the exhibit in the Wizards of the Coast booth at Celebration III while many of the tens of thousands of fans scheduled to attend the convention witness his work. Amazingly, Berg doesn't rely on earthly inventions, such as tape, glue or any other types of adhesives, to keep the structure standing, but relies instead on Jedi Concentration. "I believe the Jedi Council would be pleased as I rely on nothing more than 'The Force' of the universe to keep my creations standing," said Berg, who holds several universe card-stacking records and most recently created the New York City skyline on ABC's Good Morning America. "While I've built replicas of dozens of Earth-based buildings and skylines in my career, this will be the first time I've built something from a galaxy far, far away." As Star Wars fans recall, the crew of the Millennium Falcon sought refuge at the Cloud City outpost during Star Wars: Episode V The Empire Strikes Back. Unfortunately, all doesn't go as planned as Darth Vader entombs Han Solo in carbonite and turns the Rebel pilot over to bounty hunter Boba Fett. The city also serves as the backdrop for the epic lightsaber battle between Luke Skywalker and Darth Vader when Lord Vader declares, "Luke...I am your father!" The card-stacking exhibit will be completed early on Sunday, April 24. Shortly thereafter, Berg will grab a lightsaber and destroy the cityscape by sending the cards to the nether regions of the universe. The cityscape will include tens of thousands of cards from the new STAR WARS TRADING CARD GAME (TCG) -- REVENGE OF THE SITH Expansion which features scenes from the upcoming movie such as the battle on the Wookiee home world of Kashyyyk, the emergence of Emperor Palpatine, and the origins of Darth Vader. 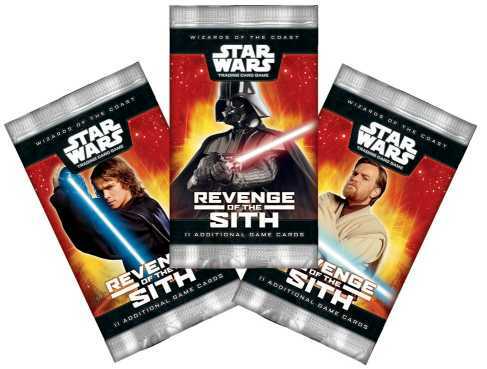 Produced by Wizards of the Coast, a developer and publisher of game-based entertainment products and a subsidiary of Hasbro, Inc. (NYSE: HAS), REVENGE OF THE SITH is the tenth expansion for the Star Wars TCG. The new game offers the first-ever introduction of equipment cards into the series, broadening the game play and creating a new level of strategy. As with the previous editions, players opt to follow their calling to the light or the dark side of the Force and then compete using their customized, collected deck. Rebel and Imperial Forces then engage in energy-packed battles in three arenas (space, ground, character) and must conquer their opponent in two of the three to lay claim to the universe. Booster packs, which help expand a player's deck and contain 11 cards, have a suggested retail price of $3.49 (booster blisters have a suggested retail price of $3.69). The new cards can be incorporated into gamers' existing decks, allowing battles that pit characters and space ships from Episode III against characters and space ships from the five additional movies in the Star Wars saga. Wizards of the Coast, Inc., a subsidiary of Hasbro, Inc. (NYSE:HAS), is a worldwide leader in the trading card game and tabletop roleplaying game categories, and a leading developer and publisher of game-based entertainment products. The company holds an exclusive patent on trading card games (TCGs) and their method of play and produces the premier trading card game, MAGIC: THE GATHERING(R), among many other trading card games and family card and board games. Wizards is also a leading publisher of roleplaying games, such as DUNGEONS & DRAGONS(R), and publisher of fantasy series fiction with numerous New York Times best-sellers. For more information, visit the Wizards of the Coast website at www.wizards.com.